And people have already spend hundreds of thousands of hours playing them online. Timing could turn out to be everything for Lost Planet: Extreme Conditions. The Japanese shooter set in a snowy Earth-alike gone awry is due this winter. The buzz has, however, been building for months, through a series of demos that this week hit a new high. Capcom said on Monday that combined downloads for the single- and multiplayer demos now stand at more than a million. 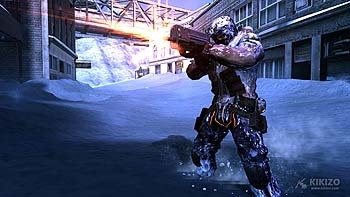 Players have also spent more than 300,000 hours playing the multiplayer demo online. That's a lot of snow. Capcom broke new ground releasing a singleplayer demo for Lost Planet during the Electronic Entertainment Expo as far back as May, and the multiplayer demo followed in November. Demo downloads are one thing, but will the excitement spread to the final product? This is the question Capcom will be mulling in the run up to the game's release on 12 January.